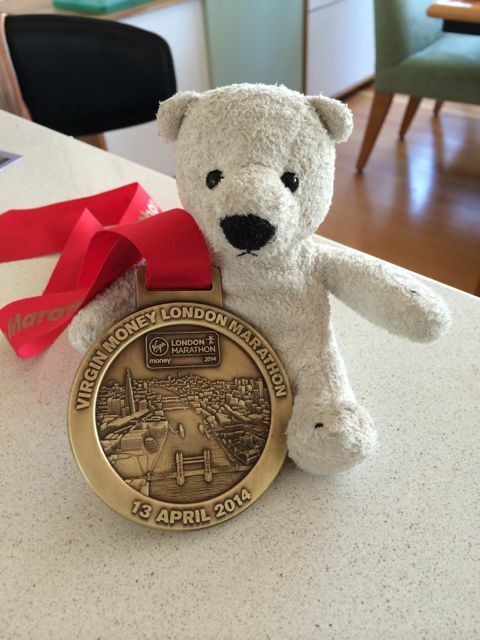 London Marathon was a great experience but a tough race. 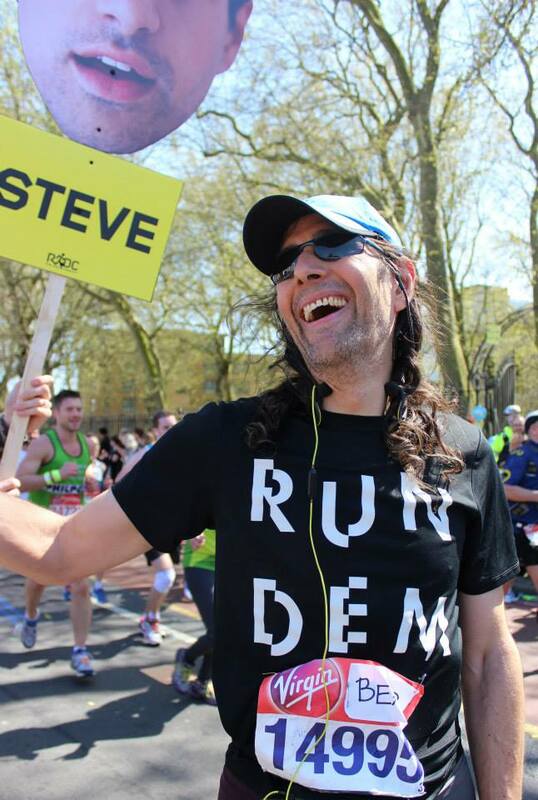 The weather was beautiful, the crowds were amazing (especially the extraordinary efforts of my Run Dem Crew tribe). It was great to be running a marathon in my adopted hometown. Highlights included running over Tower Bridge, where the crowd support is incredible); running past the Tower of London; seeing the elites including current world record holder Wilson Kipsang (who set the record in the Berlin Marathon in September) and Mo Farah; finishing just in front of Buckingham Palace; and the enormous outpouring of love I received from my crew afterwards. I was also thrilled that two of my running friends not only qualified for the Boston Marathon, but have times so good that they are sure to get places for next year's race. I can't really talk about the ways in which this was a tough race without getting technical, so non-runners might want to stop reading now (and appreciate my uncharacteristic brevity). If you are still with me, then be prepared. What I am about to tell you should send shivers up and down your spine. I had a race post-mortem with my coach (the amazing Barbara Brunner of EnergyLab) and she thinks the most likely problem was that my taper was wrong. If that doesn't scare you a bit, let me work through some of the ramifications for you. First off, this means that even working with an excellent coach, running five road marathons and three trail races in eighteen months (so there have been chances to try different things), the taper is still a cause for experimentation. It isn't just about plugging numbers into a formula and getting an answer. It's about seeing how my body responds to different conditions, understanding the relationship between intensity of training and my body's ability to recover (and how that changes over time as I age), and adjusting all of this over time as I improve my nutrition. Finally, even if the above could have led to a good answer, there is no way to know whether it is the best answer unless you try something else (sorry folks, that's just science). So, for those of you who are using training plans off of the internet, please be aware that those plans can't possibly know your body. If you are going to use such a plan (and I fully understand that not everyone has the option of a personal coach) you need to take responsibility for figuring out what in that plan works for you and what doesn't. The final scary ramification of the taper being wrong is that the only way to really figure out how to get your best racing performance (at any distance) is to run enough races that you can figure things out. Which is brutally hard with marathons. Especially since 'figuring things out' might mean having a race go very differently from how you had hoped. Another experiment for this race was using my heart rate as the arbiter of whether I needed to work harder, or ease up during the race. This experiment went quite well. While the times were not what I had wanted, I felt confident that I had run the race I was capable of running. It was only when things started to go physically wrong (around mile 18-19) that I lost my sense of being in control. Running on heart rate is really different from running on pace. I've been working the past month or so on doing my running at race pace with my Garmin watch set to a display that shows two numbers: how long I have been running, and what zone is my heart rate. Which of course requires knowing what your personal zones are to plug them into the watch to begin with. This is something that can be accomplished with an hour's session on a treadmill with someone who knows what they are doing. You can't use any of the formulas for calculating max heart rate: they are inaccurate to begin with, and they definitely don't apply to people as fit as us runners. The cool thing is that the heart rate zone is really a measure of what your effort is as a percentage of your maximum. This number gives you a good indication of whether or not you are running as hard as you should be. Remember, a marathon is not like a 10K, most of us can't go out at suicide pace and have any chance at all of finishing with any pace at all. But you don't want to take it too easy, you will never get the times you want that way. The other great thing about heart rate is that it responds much slower to changes than pace. So looking at the watch every thirty seconds is really senseless. Finally, once you learn to run this way the heart rate is really just corroboration of what you already know your body is doing. During the race when I felt like I was slow, the heart rate confirmed I should be working a bit harder. When I felt that I might be getting carried away, the heart rate told me to back off a bit. The next step for me is learning to go longer and longer distances without looking at the watch at all. Which is another thing I work on in training. You need to sort out your race shoes well in advance. I realised about a month before London Marathon that I didn't really have a good pair of shoes to race in. And I didn't have time to break in a new pair (even the Vibrams take a bit of work to be ready for running 26 miles). So I ran in shoes that were more worn than I would have liked. And that may well have contributed to the massive blisters I ended up with on my feet. You need to have your nutrition plan fully worked out, including where your electrolytes are coming from. The biggest drawback to London is that nothing provided during the race contains electrolytes. Lots of sugar in Lucozade, but none of what your body needs most. I had brought a small packet of Nuun hydration tablets (actually powder and bits to fit into the small water bottles handed out during the race) but that went missing. My theory is that when I pulled the first gel out of the pocket with the electrolytes they got pulled out as well and flew away. I had a backup, but I forgot about it! I actually took my Margarita Shot Bloks out while looking for a gel around Mile 19 and rather than thinking "oh good, electrolytes!" I thought "that's not what I want," and put them back in my race belt. Big mistake. But realisticaly you can't expect yourself to be thinking clearly 2.5 hours into a marathon. Between the lack of electrolytes and perhaps some changes in running technique due to blisters my calves cramped up big time right around that Mile 19 marker. And that was my race done. If you want to run marathons you have to be tough. Let me repeat: at Mile 19 my race was done. Only problem is the finish line is at Mile 26.2. So I had to grind out seven hard miles on painful blisters and blown calves. And I expect no special recognition for that. That's what it takes some days. However long it takes, whatever goes wrong, at the end of the day you cross that line you have accomplished something. I was down at the end, and my friends picked me right up. They reminded me that the important thing was that I had run a marathon. If you run marathons, I really hope you have friends like mine in your life on tough race days. For everyone, I hope you have friends like this around whenever you have a tough day. This page contains a single entry by Daniel Maskit published on April 16, 2014 8:37 PM. The London Marathon Street by Street was the previous entry in this blog. Vibram Vilified is the next entry in this blog.